Marker #4, silverpoint and acrylic on prepared paper, 29.5” x 31”, 2012. My work uses detailed and slow processes of making to examine the subtleties of human interactions with other bodies and the natural world. While performative work and sculpture holds an important place in my practice, drawing has become a primary process of investigation. Prepared images and objects are edited, manipulated, and represented through the process of drawing as a way to isolate particular moments and points of contact. The presence of the human, both depicted and implied, frequently appears alongside imagery commonly associated with the idea of nature: trees, cacti, earth, and “landscape”. 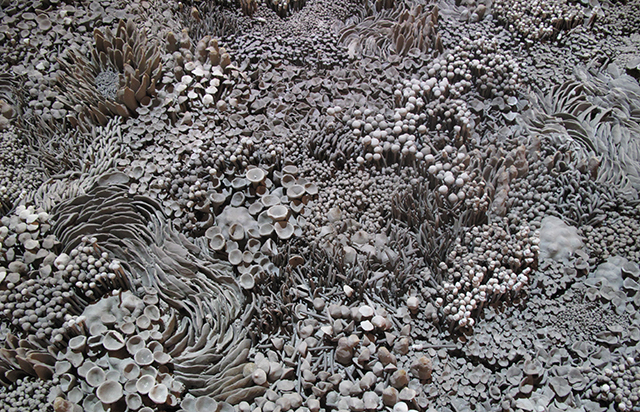 Throughout the work is an ongoing attempt to make connections from the experience of an individual to the larger world, with a particular interest in unraveling our shifting concepts of nature, and understanding our role and place within it. I grew up in Arizona, in a landscape that I didn’t really appreciate until I was in my later teens. My mom had lived on a farm in Casa Grande (about half-way between Phoenix and Tucson), and she wanted my sister and I to have some aspects of that experience, so she and my dad bought a house on an acre and a quarter of land zoned as horse property in Tempe. So growing up, we had chickens, ducks, goats, sheep, a few horses, tortoises, turtles, dogs, cats, and birds, and a lot of outside space in which to play. My dad was an engineer, and my mom was always making and growing things, so I really attribute my interest in making and attention to detail to their influences. My sister and I were also given plenty of encouragement to be creative. I think that whole childhood experience really planted the seeds of being somewhat introspective and pretty curious about the world, which both play a big role in the work I make. 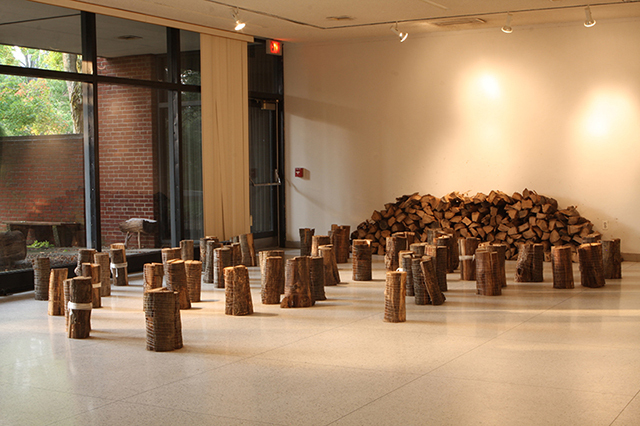 Woodlot, performance/installation work, ½ cord firewood and string, 8 hours, part of “8-Hour Projects: Performativity” at Allegheny College, Meadville, PA, 2013. I have a studio practice in the traditional sense, in that “making” is a big part of my work. 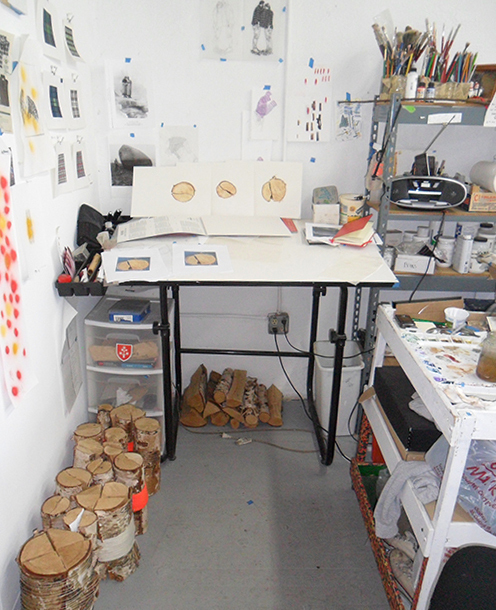 I try to keep somewhat regular studio hours, and much of that time is spent working alone in my space. For me, there is a mental shift that happens when I enter the studio, almost a kind of switch that turns off (most) of the everyday distractions, allowing me to enter into the work. I do reading, research, and some making outside of my studio, but it is in the studio that I am most productive and focused. 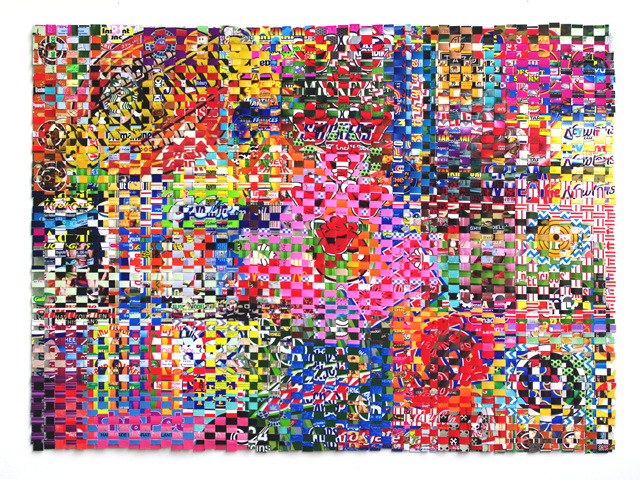 I think this idea of a place carved away from distraction, where one can focus their ideas, whether or not it is used as a space for making, is still relevant across many types of contemporary artistic practices. When I first started making art, I definitely had that stereotypical vision of the individual artist working in the studio, creating work for exhibitions and the like. And that’s certainly a big part of my practice, but I have found it has developed into something much more complex. First, I don’t think that I imagined my work would involve as much research in the form of reading and seeking out information to inform its conceptual backbone. I also didn’t conceive of how many different roles I would play as an artist, or the way my practice would extend beyond my individual work. I have become much more engaged as a member of a community of artists and creative people, in Boston and beyond, as a teacher and a collaborator. Starting the website Temporary Land Bridge, which features interviews with artists, artist writing, and exhibition coverage, has allowed me to actively participate in this community in a different way. Working with the New Craft Artists in Action collective has provided an entry point for more community-engaged art making, and has taught me a lot about collaboration. Ultimately, I wear many more hats than I ever imagined. 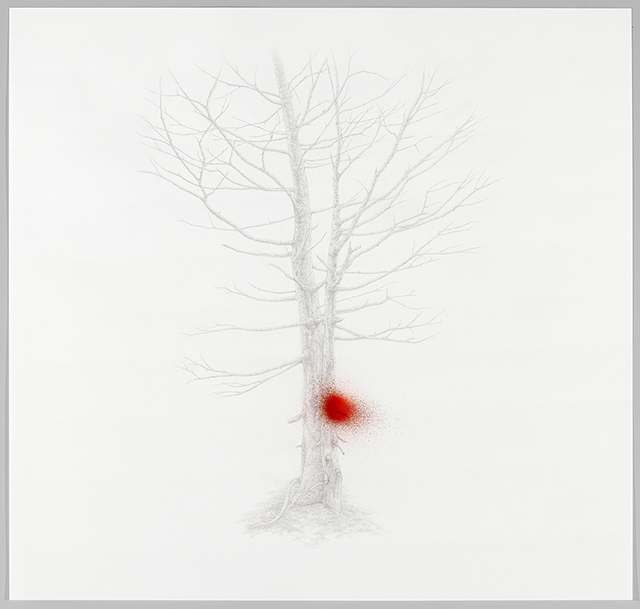 The Tree #1, silverpoint and watercolor on prepared paper, 28.75″ x 23.25″, 2011. I’m a morning person, so I have the most energy and get my best work done when I get in the studio on the early side. This isn’t always possible though. Since I teach, my schedule is changing every four or five months, and it often feels like I’m just getting a balance worked out when it changes again. During the academic year, I set up a studio schedule around my teaching schedule, and try to protect that time the best I can. I don’t go to the studio every day, but in a good week, I’ll be there 4 or 5 days, even if just for a few hours. It’s an interesting time to think about this. I finished graduate school about 5 years ago, and since that time, my work has changed in more subtle ways than during graduate school. An interest in human experience and relationships, landscape, and nature has remained a major thread throughout the work, as well as my love for slow and detailed processes such as silverpoint drawing and knitting. On a formal and technical level, my drawings have become visibly tighter and more controlled, which has made the need for some type of disruption to this control (such as the paint sprays in the “Marker” series) really important. I have allowed myself permission to explore sculpture as a final form in my practice, which I was uneasy to do earlier on. While my work is still very much founded in individual experience, I’m looking towards ways that extend these issues into a larger discussion. On a conceptual level, I have been delving much deeper into studies of the constructed idea of nature and how this aligns with the very real natural world. At this point in time, what we consider “nature” has been completely impacted by human actions. The overlap of this notion and its reality presents complex questions about it means to try to preserve or conserve what remains. As I mentioned prior, my family really had a big role in setting the stage that encouraged the sensibilities that brought me to art making. My husband, Kirk Amaral Snow, who is also an artist, has had an exceptional impact on the work I do. We share a studio, bounce ideas off one another, offer each other critique. He’s not afraid to push me, and I really trust his opinion. Outside of the personal sphere, the case studies and writings of neurologist Oliver Sacks have completely transformed my understanding of how we perceive and experience the world through our bodies. Rebecca Solnit’s books, spanning subjects as wide as walking, being lost, landscape, and photography, have really stuck with me. Michael Pollan’s writing on food, farming, gardening, and the built environment are something I return to again and again. In the studio, I am constantly listening to podcasts. Radiolab, with hosts Jad Abumrad and Robert Krulwich, is a constant favorite, and it totally blows my mind. First, I’d say a farmer; it runs in my family and I was born with a love for plants and vegetables. But I have a pretty romantic version of it in my head; I know it would be a ton of work to make it work. Otherwise, I could perhaps see myself as a mail carrier. I’ve been watching the mail women in my neighborhood, and in the summer it seems like it could be nice. You get to walk around outside all day, get a little exercise and fresh air, have some time for your mind to wander, but you do have to wear that uniform. Andrea Sherrill Evans (b. 1982, Mesa, AZ) began making art at an early age and went on to study painting at Arizona State University, receiving her BFA in 2004. 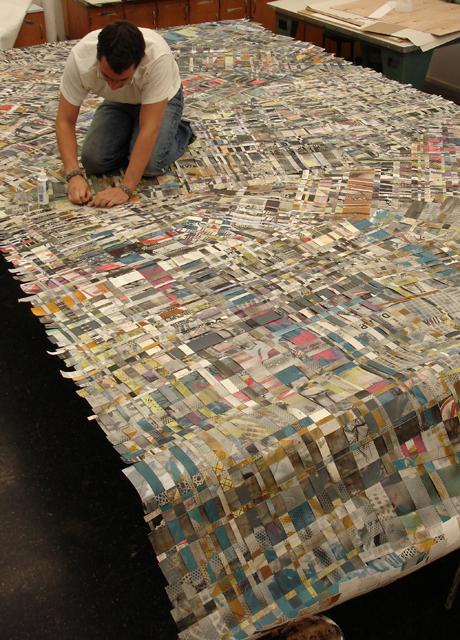 Evans moved to Boston, Massachusetts in 2006 to attend graduate school at the School of the Museum of Fine Arts, Boston/Tufts University (MFA 2009). 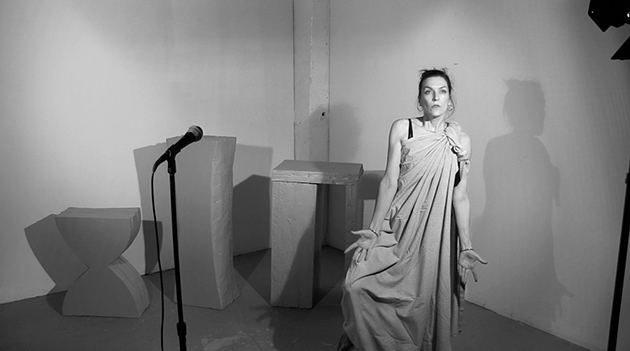 Evans’ practice is based in drawing, painting, performance, and sculpture. 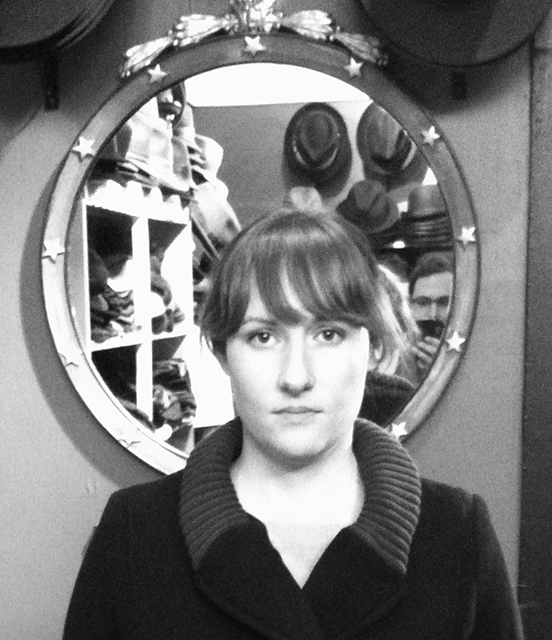 She is a recipient of the 2012 Massachusetts Cultural Council Artist Fellowship in Drawing, 2012 St. Botolph Club Foundation Emerging Artist Award, and 2010 Blanche E. Colman Award. Her work has been exhibited at locations including Montserrat College of Art (Beverly, MA), Allegheny College (Meadville, PA), SPACE Gallery (Pittsburgh, PA), Proof Gallery (Boston, MA), Drive-By (Watertown, MA), Mobius (Boston, MA), New Art Center (Newton, MA), Phoenix College (Phoenix, AZ), and eye lounge (Phoenix, AZ). 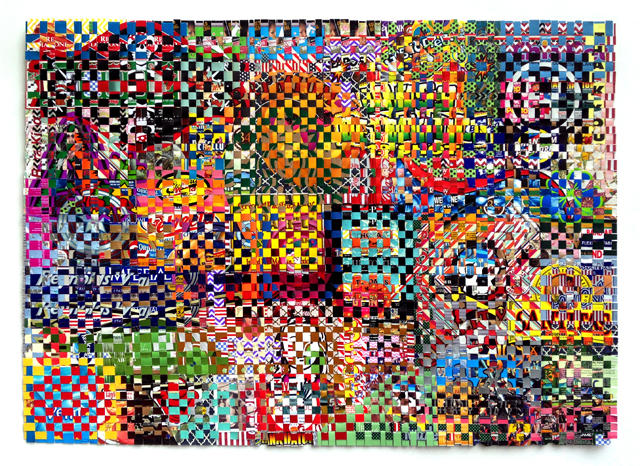 In addition to her independent studio practice, Evans is a member of the New Craft Artists in Action (NCAA), a collective dedicated to creating handmade basketball nets for empty hoops in public spaces. Their self-published book of net patterns, knit and crochet instructions, and community projects, Networks, came out in early 2014. 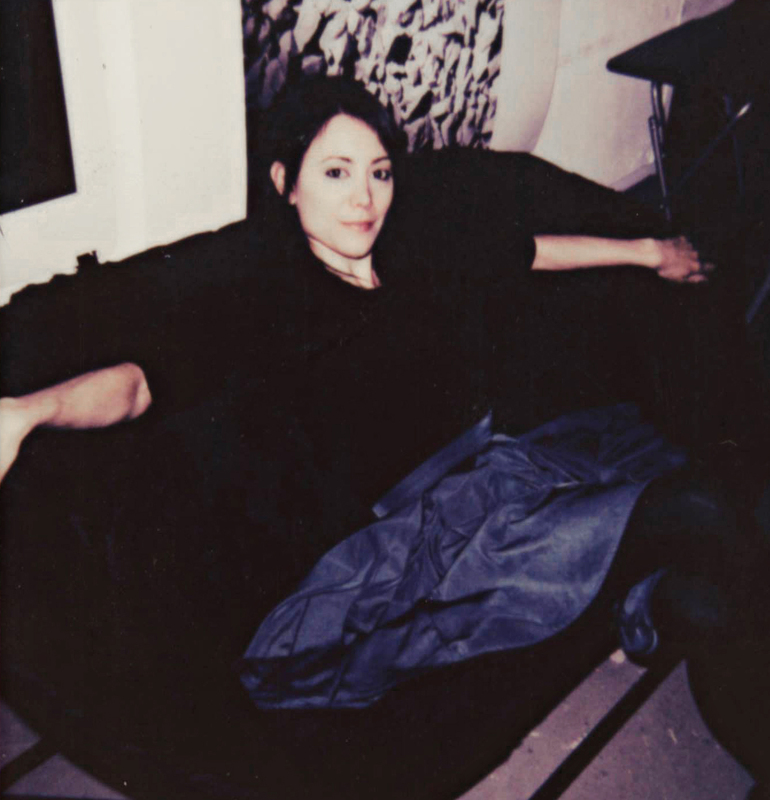 Evans is the founder and co-editor of Temporary Land Bridge, a website focused on art practice in its various stages of creation, contextualization, and exhibition. She is a visiting lecturer in the Studio Foundation program at Massachusetts College of Art and Design and currently lives in Boston, MA. 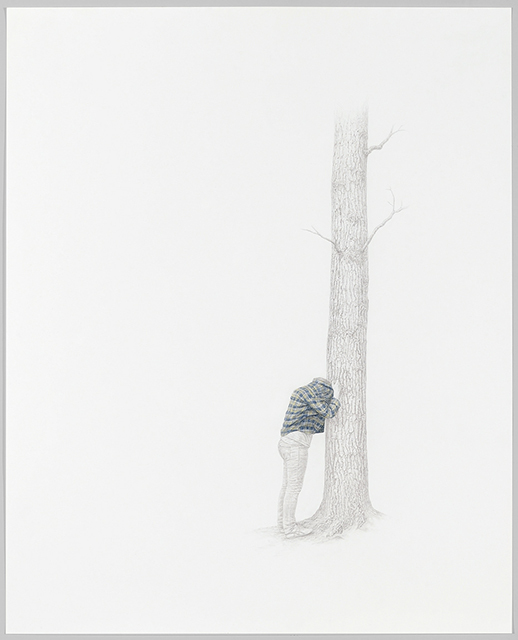 This entry was posted in Uncategorized and tagged Andrea Sherrill Evans, Boston, Drawing, nature, silverpoint. Bookmark the permalink.